I had to pop to Afflecks Palace today for work so I was pretty hopeful that I’d spot a dog in the Northern Quarter! 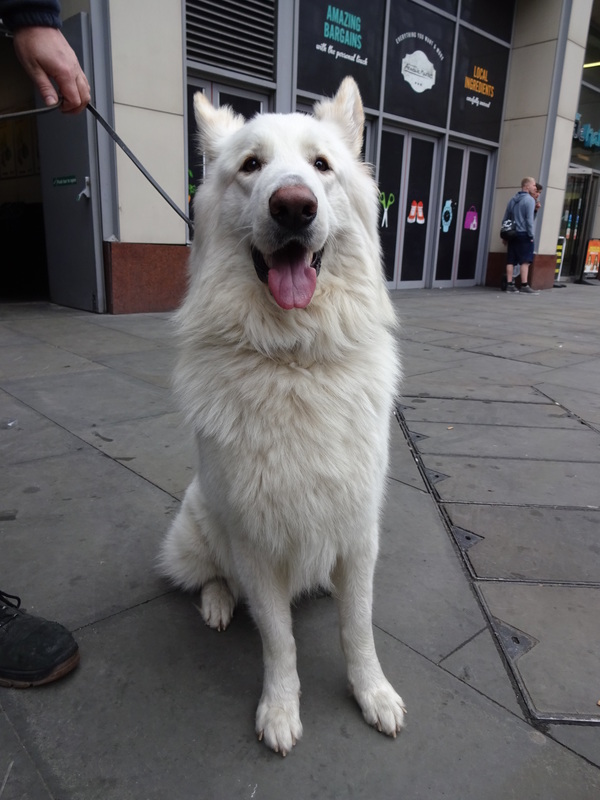 I was in luck and on my way back to work I spotted and extremely handsome White German Shepherd called Ambrose. To be honest I didn’t know you could get white German Shepherds before! Interestingly White German Shepherds were disqualified from the German Shepherd Dog club in 1933 when the Nazis came to power! Ambrose is a very chatty and friendly boy, he was talking to us the whole time! Ambrose lives with two cats but the don’t always get on that well! Ambrose’s human grandparents have a massive Saint Bernard; I was shown a picture of the two together and believe it or not Ambrose looked small next him! Favourite toy: Soft squeaky toy pumpkin! Favourite pastime: Playing catch and having a cuddle!